Inflammation of the para-nasal sinuses, medically known as “Sinusitis” or “Rhino-sinusitis”, can be due to infection or allergy. 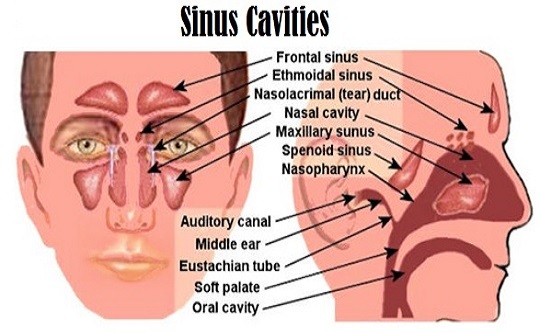 Sinus infection is caused by either bacteria, viruses, or fungi. Viral Sinus Infection always last for only short period then disappears. Bacterial Sinus Infection is treated with antibiotics which carry the dangers of killing both useful and harmful bacteria. While it is effective in fighting bacterial infections, antibiotics are also responsible for allowing fungus to grow and upset body flora balance. If antibiotics are used too often for things they can’t treat — like colds, flu or other viral or fungal infections — not only are they of no benefit, they become less effective against bacteria. Fungal Sinus Infection is the most ignored, but it is in most cases the tricky culprit. Fungal infections are responsible for a long list of very serious diseases and disorders. Fungi can invade various organs and switch between them. They cause great damages to the immune system. Fungal infections can be wiped out with anti-fungal diet (Take and Avoid certain foods), and anti-fungal medication, such as Triazoles. Taking anti-fungal medication and pro-biotic food is necessary on a regular basis especially after taking any course of antibiotic. Treating fungal infections must be considered the first and most important line of action before considering any antibiotic medication.